Operational processes and systems are becoming increasingly critical and have greater interdependence. So the impact of an unavailable system or operational process is bigger today. As a result, disaster recovery is no longer just nice to have, but is absolutely essential. The foundation is built by a solid disaster recovery plan, with good offsite back-ups, replication or deduplication. Which solution is best suited for you, depends on your needs. We’ll examine with you which type of disaster recovery is suitable for your organization. Nucleus Online Back-Up & Recovery allows you to perform a secure external back-up at a minimum of cost and effort. This solution is suitable for desktops, laptops and servers, and is compatible with Windows, Mac and Linux. It is the ideal solution for small to medium-sized businesses where most data is not operational-critical. Veeam Cloud Connect back-up Nucleus uses the advanced technology of the Veeam Cloud Connect Back-Up (VCC Back-up) in order to create cloud back-ups of your virtual servers, fast and easy. You simply and securely store your back-ups in our data centres, without having to manage the back-up infrastructure yourself. Cloud replication saves an exact and permanently available copy of al your virtual servers in the cloud. Do you manage critical applications that need an uptime of 99,99% or higher? Then it’s best to deduplicate them at several locations. 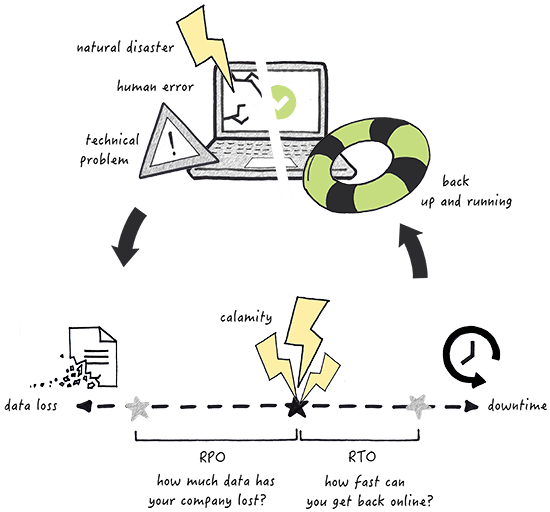 What does disaster recovery mean for you?